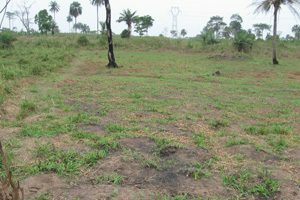 Augustin also chose to grow rice, like Jérémie. 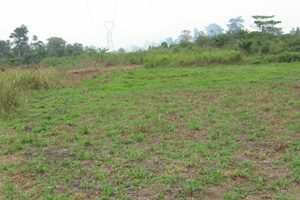 Augustin’s plot of land lies near the high tension power lines that bring electricity from the hydroelectric dam to towns and villages of southwest Côte d’Ivoire. One has to be careful when burning one’s brush pile after the clearing is done. Typically the land is cleared by machette. The cut brush and any fallen trees, are left to dry in the sun. When everything is dry, the farmer comes back and piles up brush the burning. Wanted trees, like the oil palm trees seen in these pictures, are protected as much as possible from the hot fire. Not long after the burning, the land is planted. Usually this is timed to coincide with the first rains. Augustin and son out in the rice field. Notice the high tension power lines in the background. In this picture you can see the smoke of another farm being burned in preparation for planting. 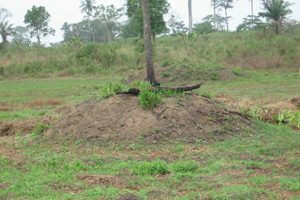 This hill will make a good place for Augustin’s children to survey the rice farm when it is ripening. This is done in the day time. The family will take turns making noise and using slings and sling shots to chase away the rice-eating weaver birds. Sometimes a system of strings and cans with rocks in them tied to the strings. AUGUSTIN’S STATUS: Augustin’s one hectar rice farm did not produce as he had hoped, for four reasons: 1) the soil was depleted and the local agricultural agent did not fertilize his farm; 2) the seed he chose was not of good quality; 3) the rain did not come at the appropriate time; and 4) the birds damaged much of what came up. 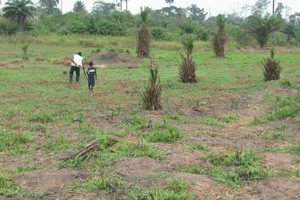 Instead of the expected 60 bags of rice, Augustin only harvested 10 bags. 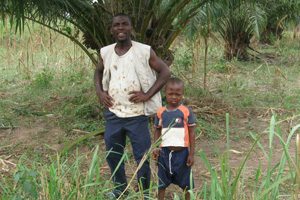 Augustin continues to slowly pay back his loan from his other farming activities.